Brian Fies started a webcomic in the raw days right after his home burned down in the massive 2017 Santa Rosa fire. Right from the opening page—“On Monday, my house disappeared.”—we're drawn into the immediate emergency, the orange glow coming closer, the menacing waves of heat. That comic went viral, was made into an Emmy-winning short, and is the basis for this masterly graphic memoir. Fies uses vivid language and dramatic art to put us inside his shoes. We're walking with him past the roadblocks, back to his house as he hopes to find it still standing. “The sun was a dim orange disk behind a salmon-gray curtain of smoke. I inhaled my neighbors' lives.” The sense of loss is palpable, a kick in the gut. This is beautiful writing, visceral and deep. The deceptively simple drawings make the horror accessible and clear. The way the story unrolls, from fleeing danger to recognizing the depth of the loss, is dramatic and natural at the same time. After a page listing all the things his family would never see again (the sentimental, the irreplaceable, the valuable), Fies goes shopping: “It's unnerving to need both everything and nothing.” That one sentence sums up his new reality. 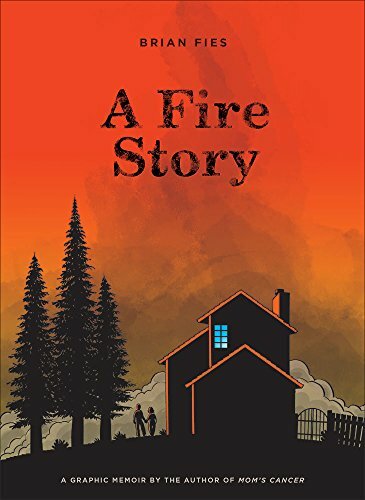 Just the story of the fire and its aftermath would make for a stunning book, but Fies adds layers of depth to the memoir by including other people's stories. We read about a range of people who fled the fire and lost everything, how they reacted, how they coped. Fies also provides comparisons to make it easier to grasp the extent of the disaster, which easily becomes abstract. Honest throughout, Fies ends the book recognizing that people want an inspirational message. “But I have no uplift to give, and anyone who says 'closure' around me may get a punch in the nose.” Still the book is hopeful, closing on an image of daffodils sprouting in the gray earth. His home may be no more than a patch of dirt, but it's his patch, and we know he'll make the most of it.